This offer is so great because not only are the recipes in this cookbook amazing but you also receive the recipe chip. The recipe chip makes cooking with your Thermomix super easy and with the newly released My Thermomix Recipe Platform you will also have all of the recipes at your finger tips for easy access, meal planning and to create shopping lists. All you have to do is activate your recipe chip. For more information about the recipe platform and how to register click here. How does the current purchase offer work? Purchase your Thermomix before 3 April 2016 and receive the Everyday Cooking for Thermomix Families cookbook and recipe chip. Easy as that! View the promo flyer here. But that’s not all. This offer can be used in conjunction with the current Exclusive Bonus Host Reward. 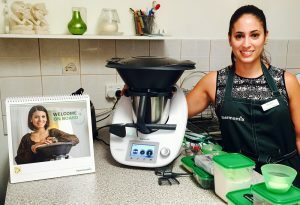 Receive a free 2.6L Round ThermoServer when you host a qualifying demo before 31 March 2016 where there is a Thermomix purchase. View the promo flyer here. What’s a ThermoServer? A ThermoServer is a stainless steel bowl which keeps food hotter or cooler for longer. Click here for more info. Standard host rewards still apply which means you could have two round 2.6L ThermoServers! Contact your consultant for more info. For more information about hosting a demo click here.